If you like to make beer bread you will love this modern twist on the classic recipe- Strawberry Margarita Beer Bread only takes 4 ingredients! Now I know a lot of people who don’t like to drink beer that love beer bread. The only way you’ll ever see my husband enjoying a beer is if he can chew it. Give him bread or soup, or better yet throw in some cheese and you’re set. He even helped me develop the recipe for my Boozy Burger and Fry Pies last winter. 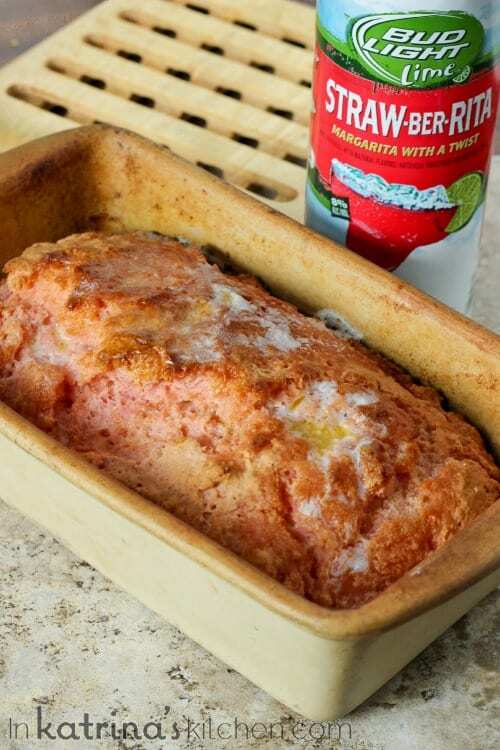 If you love beer bread and you love margaritas you should definitely switch things up and try this recipe! I actually made this bread last summer and forgot to share it with you. But it’s so easy, only takes 4 ingredients, and you don’t even need a mixer! How could I keep you waiting any longer? Of course if you’re not a margarita lover you can swap it out for your favorite ale. Try it warm out of the oven with a slather of butter and a sprinkling of salt (of course!). Mmmmmmmm! And if you’re into making bread out of unexpected ingredients don’t miss my recipe for 2-Ingredient Ice Cream Bread! Preheat oven to 375° F. Spray 9x5 load pan with non-stick spray. Whisk together flour and sugar in a large bowl. 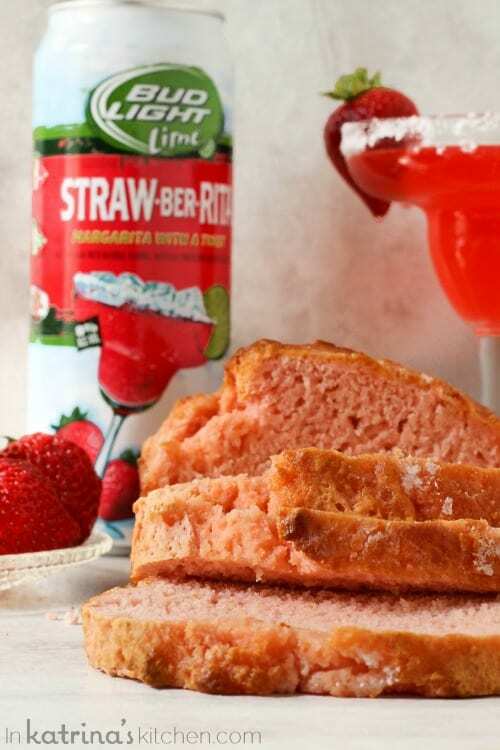 Pour in the Straw-Ber-Rita and mix with a wooden spoon until just combined. Place dough in loaf pan and pour melted butter over the top of the dough. Bake for 50-60 minutes until lightly browned and middle is set. Sprinkle with course salt if desired. Allow to cool 15 minutes before removing from pan. If you do not have self-rising flour you can easily make your own: 3 cups all-purpose flour, 4 1/2 teaspoons baking powder, and 1/2 teaspoon salt. Guacamole – Oh How I Love Thee! Unfortunately, there’s none in Scotland, which means I’d have to make my own, which means it certainly wouldn’t make it to bread, ha ha! So brilliant, girlfriend. And what a colour! This bread is EVERYTHING. I’ll have a slice (or three) please! This is seriously such a fun recipe!! This is just plain awesome! I love it! I want his hot out of the oven!! Love how easy it is! Omg! It looks so good! 🙂 I am thinking what I could use instead of Straw-Ber-Rita. Such a cool idea, can’t wait to try it over the summer! 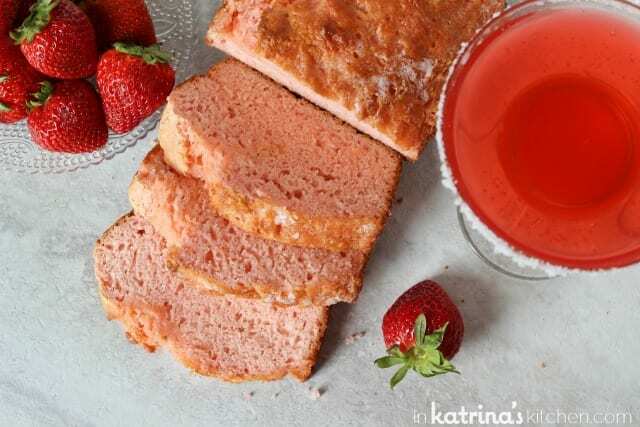 Katrina, this recipe is so very creative. I love the gorgeous hue. Pinning! This looks amazing! I am going to whip up a loaf today with my Rasp-ber-itas I have in the fridge. I can’t wait. I might even make a second loaf to take to work with me on Monday. Thanks for a simple quick bread recipe! 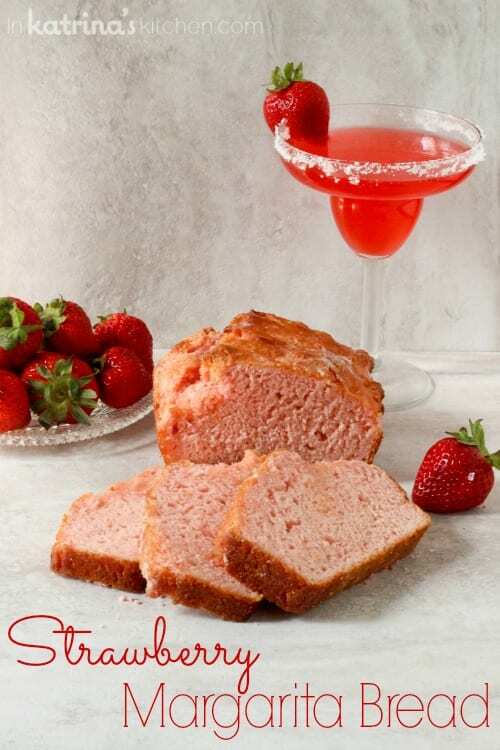 Just an update – I made this with the raz-ber-ita and it was delish and so so easy to make (that you for the self rise flour note, saved me having to google it). my 3 year old daughter couldn’t get enough of this bread. the crunchy/chewy top crust of the bread is to die for. it did turn out a funky color though. i was hoping for a pretty purple color but it turned out more of a weird purplish blue color. still edible 🙂 thanks for another recipe to add to my collection! Any suggestions for wanting to add actual strawberries (frozen or fresh) to the recipe?